This park offers a popular 23 site campground and day-use area which has a developed beach, a horseshoe pit and a nature trail. 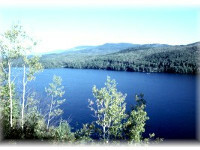 Some activities offered include hiking, exploring and fishing. This is a large, deep lake and is usually fished on a troll – included are a number of smaller lakes excellent for fly-fishing. Fishing for rainbow trout is a favourite pastime of many visitors.